Institute manager Kevin Deery is looking for his young side to have the right mind-set going into Saturday’s Tennent’s Irish Cup sixth round tie at home to Linfield (KO 3pm). The Waterside out-fit have started to stutter in recent weeks having lost their last two games, but Deery is relishing this weekend’s encounter against the Blues. “If you are at it, really at it, properly motivated and your mind-set is right, you can play well and play a lot better than what we did at the PSNI,” he stated. “It’s a game we can look forward to without the pressure we put on ourselves every week. “We expect to win every game in the Championship and it hasn’t been the case the last couple of weeks, so against Linfield it’s a game we aren’t expected to win and aren’t expected to have any say in the game, so we look forward to that side of it. Listen it’s a good tie for us and we aren’t going to be given much of a chance by people. The Stute gaffer, who won the FAI Cup on a few occasions when playing for Derry City, believes their recent dip in form can go out the window when it comes to their clash against David Healy’s side. 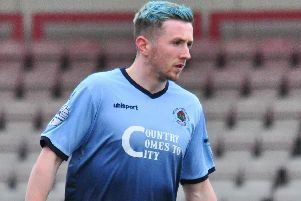 “We went to Ballyclare in the last round and won comfortably and that broke a run of results where we were drawing and then unexpectedly we have lost our last two league games, so you just never know in football and I’m done trying to guess what’s going to happen in this game,” he added. Deery admits he doesn’t mind his side going into the tie as massive underdogs. “Listen it’s a good tie for us and we aren’t going to be given much of a chance by people,” he added. Stute have virtually a fully fit squad to choose from as defender Dean Curry is back from injury, however recent signing Kyle Friel Curran misses out, the striker is cup tied having played for Dergview in the last round.